Welcome to my first non-style blog post and my first post in a new series called SIMPLIFIED LIVING. If you’ve subscribed to my newsletter or follow me on Instagram, you’ll know that my word of the year is SIMPLIFY. In order to embody this word and make it part of my everyday living, I’m going to consciously make choices to simplify our household, our family schedule, my business, my wardrobe, and more! I hope this series inspires you to live a more simplified life, making space to focus your time and energy on the things you love to do! I am so excited to share this time-saving slash eat-more-fruits-and-veggies tip that our family has now been using for the last two weeks. It has been a game-changer in our household in so many ways and I’m hoping you’ll give it a try too. WHAT IS THE MASON JAR METHOD? 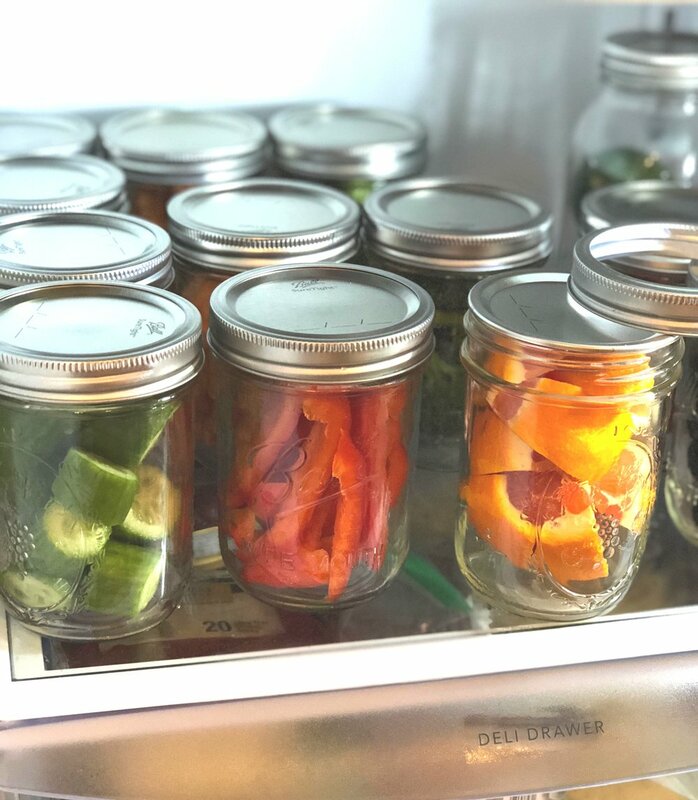 I discovered the idea on Pinterest right after the New Year where people were sharing the idea of storing fruits and vegetable in mason jars to store/ keep fresh produce lasting longer. I always feel like we’re throwing out so many fruits and veggies at the end of the week because we a) didn’t get to it before they went bad b) forgot about them! The Mason Jar Method seemed like a good system to address both pain points. I started out with a simple 12-pack of mason jars (16oz, wide mouth) from Target. Then, I bought my usual amount of fruits and veggies for the week. On Sunday night, my husband washed the jars while I prepped the produce. This has now become part of our weekend schedule. We’ll need to get the kids involved next weekend! We ate A LOT more fruits and veggies during the first week. The kids helped themselves to peppers, cucumbers, tomatoes, and grapes for an after school snack. By mid-week, we were running out of fruit and I had to make a mid-week grocery run to stock back up….this has never happened! School lunches became easier to pack. With everything already prepped and washed for the most part, it was a breeze to pack fruits and veggies everyday for lunch. Adding vegetables for dinner became super easy! One night I made breaded chicken and was able to quickly saute a side of zucchini which was already washed, diced, and ready to go. We did make it to the end of the first week with leftover broccoli, sweet potato fries, and carrots. When I opened the jars, they were still fresh as the day I packed them and was able to use them the following week for lunches and dinners. The 16oz size jars ended up being too small. One jar was big enough to hold a pint size of raspberries but not big enough to hold anything else. We ended up splitting many of the items into 2 jars. I would recommend buying the 32oz size jars. Really glad I bought the wide-mouth jars. These are much easier to maximize the space of the jar and store as much as you can per jar. For the pre-washed items, we placed a small paper towel square inside the bottom of the mason jar to absorb any water. Very helpful for zucchini, cucumbers, peppers, tomatoes, grapes to keep them fresh and lasting longer. The fridge is more organized (and pretty!) with the mason jars on display vs. plastic produce bags in drawers. An added benefit!! This little experiment has turned into a new way of life for our family. A little bit of time spent on Sunday night to prep and store our produce for the week is well worth it! AND EATING MORE FRUITS + VEGGIES!! HAVE YOU TRIED THE MASON JAR METHOD? WHAT IS YOUR EXPERIENCE? SHARE ANY OTHER ORGANIZING TIPS YOU MAY HAVE TOWARDS SIMPLIFIED LIVING! Are you ready to redefine your personal style? Sign up for my email newsletter and receive your FREE Style Journal! Thank you! Check your email for a welcome email and a download link for the worksheet!